TSO CBA Ratification Meeting! – Monday, August 8, 7:00 p.m. The Negotiating Committee will hold a CBA ratification meeting on Monday, August 8 at 7:00 p.m. at the Tucson Symphony Center. Only AFM members in good standing will be allowed to attend. After the conclusion of this meeting, every contracted TSO musician who is also an AFM/TFM member in good standing will receive a link from Ballot Point. You will then be able to cast your vote to ratify or reject the proposed CBA. This link will be active until 11:59 p.m. Sunday, August 14. Since many of us are still out of town, this is the best way to ensure that all eligible members are able to cast a vote confidentially. The NC believes this contract to be strong with many significant improvements to our working conditions, general governance, wages, and benefits. We recommend its ratification. Should you have any questions and are not able to attend the meeting, please do not hesitate to be in touch with one of us. The Tucson Flute Club is seeking a music director/conductor. A small stipend is offered to the music director/conductor for each service. For complete information, please email your request to TucsonFluteClub@gmail.com. The deadline for applications is December 1, 2015. THE FIND A TEACHER WORKSHOP RETURNS! Are you an instrumental music student, or someone who really wants to learn how to play? NOW is your chance for a free mini-lesson! 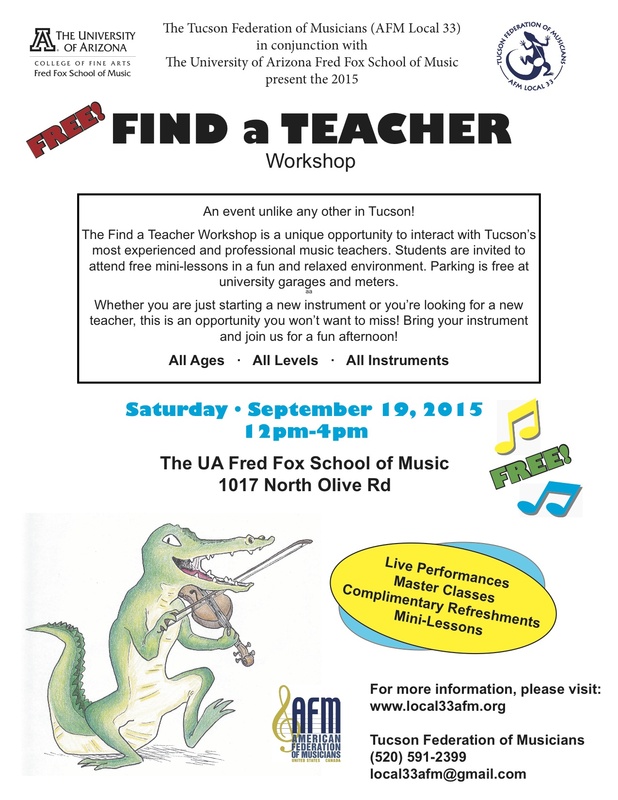 The Find a Teacher Workshop is your opportunity to have personal time with one (or more) of Tucson’s most accomplished players and teachers! Local 33’s first FTW in 2013 was such a success that we knew we had to make it a regular event in Tucson! HERE are some details from Local 33’s first FTW in 2013 so that you can see more about this event. When: Saturday, September 19th from 12 – 4 PM. NOTICE OF LOCAL 33 ELECTIONS! 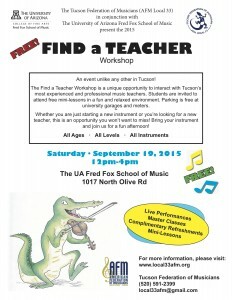 For all Tucson Federation of Musicians Members. Nominations must be submitted by October 1, 2015. The term length for all positions is two years, beginning January 1, 2016. Full duties and responsibilities for each position, as well as complete election procedures, are detailed in the Local 33 Bylaws which can be found on the Members Page. For more detailed information, and for petitions for nominations, visit the Members Page. Pima County TCC Renovation Bond Initiative Needs YOUR Input! Pima County is deliberating whether to put a bond issue before the voters. This bond would contain sorely needed repairs, renovations and updates to the venues at the TCC complex including the Music Hall, Leo Rich Theater and the surrounding landscaping. The Music Hall improvements include new seats, projection gear, a renovated lobby and bathrooms, enhanced acoustics and a renovated backstage and on-stage area improving the functionality for performing artists and musicians. The Leo Rich improvements are of a similar scope. This bond does NOT add to the property tax. The proposed improvements can be read HERE. A petition to the county urging them to go ahead with the bond can be signed HERE! You can also call your county supervisor and tell them to go ahead with the plan. Find out which district you are in HERE. You can get the number of the Supervisor for that district HERE. You can also contact Tucson Mayor Jonathan Rothschild and the Tucson City Council. 1. You support a November 2015 Bond Election – Let the community decide. 2. You will vote in a November 2015 Bond Election – Declaring your “yes” now is important. 3. Voice your opinion about civic funding for arts facilities. We musicians need to come out in support of these major venue improvements. They will make life in Tucson better, Make Tucson a more attractive destination and make superior performance experiences possible for artists and patrons alike! Final Rules for Musical Instrument Air Travel Released by USDOT! The AFM along with allies in Congress have made this landmark agreement possible. The AFM will be releasing a more reader usable version of these rules soon. • Airlines are required to allow small musical instruments, such as a violin or guitar, to be carried into the cabin and stowed in approved stowage spaces, if available, and/or under the seat. • Once safely stowed, airlines cannot require passengers to remove their instruments, even if space taken by their instrument could accommodate one or more other carry-on items. • Airlines cannot charge an additional fee for instruments as carry-on or checked baggage other than any standard fee imposed by the carrier. • Airlines are now required to train air crews, gate agents, counter agents and baggage personnel concerning appropriate procedures necessary to comply with all FAA musical instrument transportation policies. Those of you interested in reading the rule can do so here: http://www.dot.gov/airconsumer/final-rule-musical-instruments. 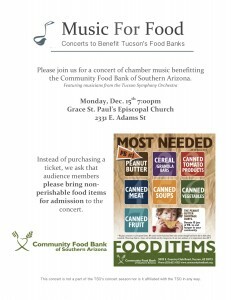 Call to Musicians: Music for Food Benefit Concert for Tucson Community Food Bank! One of our TFM Members is organizing a concert to benefit Tucson’s Community Food Bank. 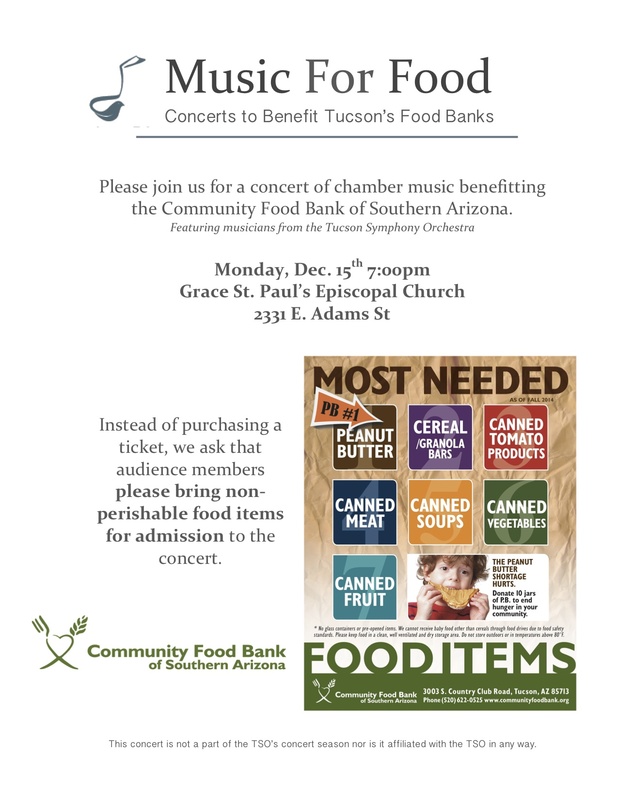 I’m organizing a concert of chamber music that will benefit Joseph’s Pantry, a branch of the Community Food Bank of Southern Arizona. Instead of buying tickets, audience members will be asked to bring nonperishable food items that will be donated to Joseph’s Pantry. If you would like to donate your time to perform, please let me know. It would be great to put together a variety of pieces on the program, so if you have anything at all that you would like to play, that would be wonderful. Ensembles of up to 10 are fine, and solos are fine as well. You can play an entire work (nothing longer than 30 minutes), or just a short movement. Other than that- play anything you’d like! The concert will be on Monday, December 15th, at 7:00pm at Grace St. Paul’s Episcopal Church. Please let me know ASAP if you’d like to perform! I would be so grateful to have your support in this endeavor. If you don’t want to perform, it would mean a lot to have your presence in the audience and your support as I try to spread the word about this benefit concert. I will send along some pdfs with all the concerto info shortly, and if you spread the word to your friends, students, and other musicians, that would help so much. Contact Candy at c.n.amato@gmail.com if you would like to be involved, or bring a non-perishable food item in lieu of an admission fee if you would like to attend. Event Announcement: Cello master class and open forum on the future of music and music education. Jeffrey Solow (former ASTA National President and renowned concert cellist) will be in Tucson Monday December 8th. He will offer a cello master class at 6:00 pm and will host an open forum on the future of music and music education. This event is free and open to the public. Any music student will benefit from this forum as Mr. Solow is an incredibly inspiring and giving music advocate. Please join us for this event. Mr. Solow is an incredibly inspiring and giving music advocate. Also, there will be FREE PIZZA! This project has been made possible by a grant from the College of Fine Arts Bank One Visiting Artist Professorship Awards. Help the AFL-CIO organize the Guitar Center! Many employees of Guitar Center are fellow musicians. Let’s help all GC workers obtain fair working conditions and terms of employment. They deserve a contract! You can read about the campaign and sign the petition HERE! Congressman Grijalva is a faithful supporter of unions.